This month marks the 30th anniversary of the release of what I regard as the most powerful book ever written about the JFK assassination – Libra by Don DeLillo. Released on 15 August 1988, this extraordinary novel blends historical fact and fictional speculation to offer a mesmerising account of the infamous murder of President John F. Kennedy in his motorcade in downtown Dallas 1963. The tale is told purely from the perspective of the man predominantly – and officially at least – held responsible for the killing: Lee Harvey Oswald. Whether Oswald was the lone assassin is still open to fierce dispute, with many ballistics experts, historians and witnesses still offering to this day conflicting accounts of what transpired during that fateful November lunchtime. Despite the government-backed Warren Commission report concluding that Oswald acted alone in firing three shots from his rifle from the sixth floor of the Texas Schoolbook Depository, there is no universal consensus on several details. The number of gunmen involved, the calibre of the weaponry used, the quantity of rounds fired and from which location(s), as well as the overriding motive, are all still up for debate. 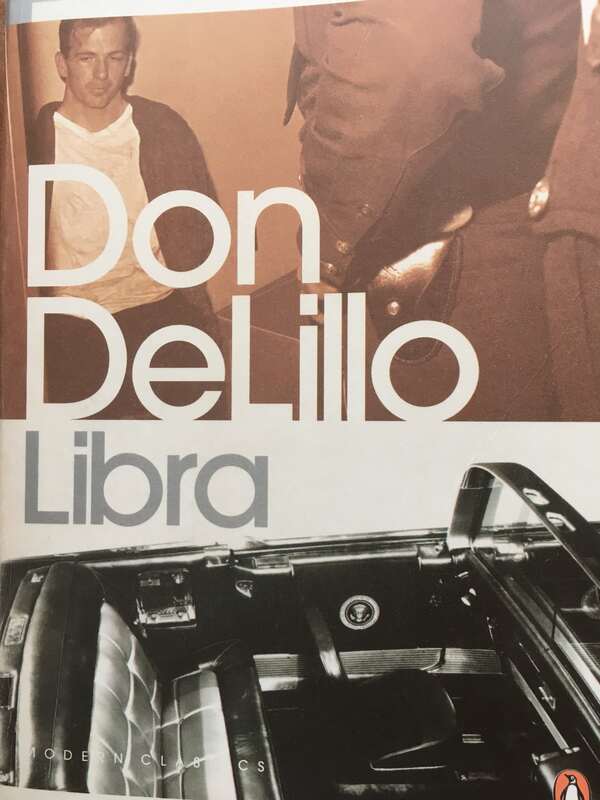 In Libra (the title being Oswald’s astrological sign), DeLillo explores what he regards as the most likely possibility: that the hit was instigated by disgruntled CIA operatives carrying deep anti-Castro ideology that Kennedy was failing to prioritise. In this version of events Oswald’s shots were – unbeknown to him – supplemented by more deft marksmanship from the grassy knoll, a controversial spot many have claimed to be the most realistic source of the fatal headshot captured so vividly and brutally in the Zapruder film. “I could perhaps have written the same book with a completely different assassination scenario,” DeLillo said in a Rolling Stone interview in 1991. But the technical details of the hit are not why people should read this book. They should read it for DeLillo’s unflinching yet visceral depiction of Oswald’s painful and pitiful journey. Starting with a haunting scene of him riding the subway through the Bronx during a turbulent two-year stay in New York in his early teens, we get an immediate sense of this misfit searching for meaning. Standing pressed against the window taking the curves, jerks and pushes of the train, he finds that the drunks, pickpockets and dark tunnels of the bowels beneath the city hold more allure for him than the glittering streets above. It’s so real you feel you can almost reach out and touch him. The book follows Oswald’s adolescent years followed by a failed stint in the US Marine Corps, an ultimately failed defection to the old Soviet Union and his violent marriage. Then it cranks up, covering his desperate but fruitless struggle to leverage his passionate communist views into a position of authority within high-ranking pro-red social circles on his return to the USA. DeLillo skilfully paints a picture of this vivid outcast – intellectually, socially, physically and emotionally – as he constantly strives to find his place, to earn the respect he craves. There is no effort to portray Oswald sympathetically, or even critically. He is carved open and exposed for readers to draw their own conclusions of the man as the narrative weaves towards Dealey Plaza. The internal conflicts and self-contradictions Oswald battles with pull him closer to the surface, sharpening the hazy sketches of his personality provided by numerous documentaries. We learn that Oswald loves his young Russian wife yet hits her, he would do anything for his children but hatches a plan that draws him away from their clutches. He is well-read but dyslexic, he is thoughtful yet not smart, he is driven but also confused. No one has analysed the complex and infuriating character that is Oswald through such a deep lens. The inner intensity of Oswald’s escape from the depository, his subsequent shooting of a police officer in the street and his arrest in a nearby cinema, and his final hours that follow is gloriously seamless and utterly compelling. Libra won The Irish Times’ first International Fiction Prize and, three decades on, is still a classic example of how to get under the skin of a multi-layered persona in the public eye and truly dissect every sense of their being.